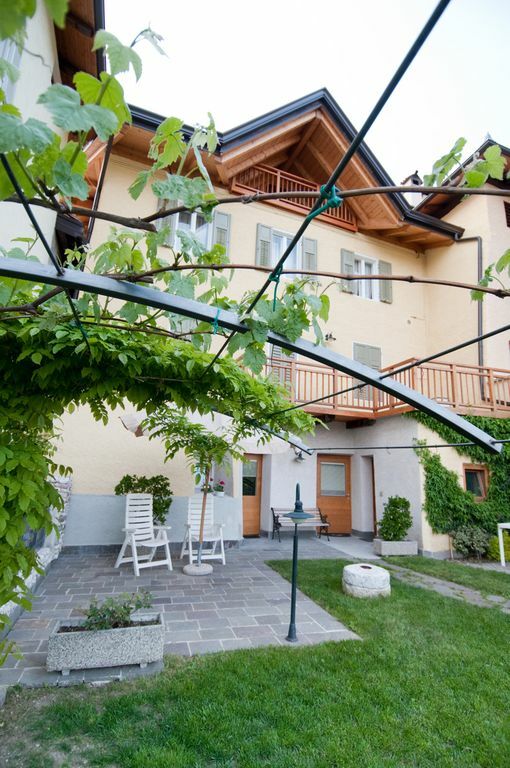 Our holiday apartment is located in the Dolomite Mountains of Brenta, an idyllic location in the village Brez. From the balcony you can enjoy a view of the town, apple orchards, and majestic mountains. Our cozy apartment is brand new and has all the comforts of home. Our apartment has 1 bedroom, 2 bathrooms, living room with pullout couch, kitchen, laundry room and balcony. Our holiday apartment is located in the Dolomite Mountains of Brenta, an idyllic location in the village Brez. From the balcony you can enjoy a view of the town, apple orchards, and majestic mountains. Our cozy apartment is brand new and has all the comforts of home. Brez is a small town in the earth of the Dolomiti of Brenta. The village is the last in the Italian speaking area of South Tyrol. The next Village is Laurein and Proveis are 4 kilometres away and are in the German speaking area of South Tyrol. In the area you can find all the outdoor activities you need and there are a lot of lakes to discover! Merano and its famous thermal baths is 30 kilometre far away. Bozen is only 40 minutes away and Trento 40 minutes where you can find lots of Museums. » free admission to more than 40 museums, 15 castles and over 40 attractions (MUSE and MART included)! » travel free on all public transport including trains in Trentino! » Discounts on 40 activities in all of Trentino! » Save up to more than € 350 per week! »The card is valid for adults and children, for the entire length of your holiday! We provide you the Trentino Guest Card for FREE. These are some of the advantages with teh card: » free admission to more than 40 museums, 15 castles and over 40 attractions (MUSE and MART included)! » travel free on all public transport including trains in Trentino! » Discounts on 40 activities in all of Trentino! » Save up to more than € 350 per week! »The card is valid for adults and children, for the entire length of your holiday! As all the previous visitors have all stated, Danielle is the perfect host from confirming accommodation availability, to making every effort for you to enjoy your stay. He even took the time to offer suggestions of place we could visit after taking time to get to know us when meeting us on arrival. It is clear he truly wants you to enjoy your stay. The apartment is clean, with good quality products throughout, and the little balcony is wonderful place to sit out on at any time of day. We spent our eights days cycling in and around the area, and we would certainly recommend a visit. Locandia Alpina restaurant situated at the bottom of the road is a must place to visit. The food is amazing, and the owner a true gentleman. On the evening we visited the restaurant was quiet, therefore he was able to spend some time with us explaining the history of the village, why they grow apples, and the history of the restaurant. A real treat. Brez is a quiet little town in the perfect location to explore the Dolomites, historic towns and beautiful National parks in the region. The apartment is top quality, with lots of space and extremely comfortable. We were blessed with good weather and Daniele organised a Trento Guest card which enabled us to do even more than we planned and saved us money! Daniele was the perfect host, making sure we had everything we needed and giving us advice on where to go and what to do. This is one of the best holidays we have ever had and would love to return again soon! Wir (zwei Erwachsene und unsere 15 jährige Tochter aus Chemnitz) haben die Wohnung im Internet anhand der Foto`s gefunden und über Home Away gebucht. Durch viel Holz und urige Möbel, moderne Badezimmer und eine Küche, in der es an nichts fehlte, ist die Wohnung so richtig gemütlich, ganz sauber und auch kuschelig warm. (Wir hatten nicht so tolles Wetter). Man hat einen schönen Blick auf die Berge, der Ort ist klein und ruhig, es gibt einen Supermarkt. Der Gastgeber Daniele Albertini hat uns sehr herzlich empfangen und hatte Tip`s für Ausflüge, für`s Wandern und weitere sportliche Aktivitäten sowie für Restaurants parat. Wir würden die Wohnung auf alle Fälle weiter empfehlen. Je nachdem, wie weit man mit dem Auto fahren möchte, gibt es jede Menge Ausflugsmöglichkeiten in der Nähe oder auch etwas weiter wie z.B. nach Bozen, zu zahlreichen Burgen, zum Gardasee, in die Berge. Schöne, gepflegte Wohnung. Hält was es verspricht. Daniele war ein sehr guter Gastgeber. Er hatte Tipps für schöne Ausflüge, Restaurants u Cafés. Die Wohnung befindet sich in einem sehr guten Zustand. Das einzige was uns gefehlt hat, war eine Garderobe um unsere Jacken aufzuhängen. Ansonsten waren wir rundherum zufrieden. We were offered a very cosy and comfortable apartment. Plenty of space with modern furnishment. The host was extremly kind and caring. We were offered helpful suggestions for outdoor activities and restaurants in Brez and the sourrounding val de non. 100 % recommendable. We are a young married couple and stayed in this gorgeous little apartment for a month. We were there in March and had an amazing time. The apartment is cosy, well kept and perfect. It has all you need! The views are breathtaking from the balcony and there are many sights to see close by. Transport is accessible - you can access nearby towns with the local bus and get to further areas via the train. The family is wonderful and very friendly. They went above and beyond to ensure we had a comfortable and memorable stay. We would be more than happy to come back again in the near future! Brez is a small town in the earth of the Dolomiti of Brenta. The village is the last in the Italian speaking area of South Tyrol. The next Village is Laurein and Proveis are 4 kilometres away and are in the German speaking area of South Tyrol. In the area you can find all the outdoor activities you need and there are a lot of lakes to discover! Merano and its famous thermal baths is 30 kilometre far away. Bozen is only 30 minutes away and Trento 50 minutes where you can find lots of Museums.